Construct dams to mitigate drought effects, Government urged – Kenyatta University TV (KUTV). All Rights Reserved. 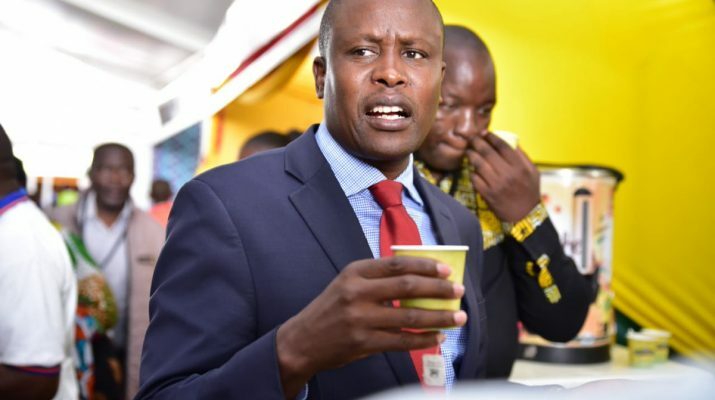 Kieni MP Kanini Kega has urged the government to construct dams in the area to curb perennial food shortages when drought strikes the area. Kega said about 100,000 people are staring at starvation in the area as the prolonged dry spell continues to ravage most parts of the country. Kega was speaking yesterday when he distributed relief food to about 10,000 people at Lamura, Kanyagia and Komu area that are mostly affected by famine. The Legislator noted that local leaders had proposed construction of eight dams to serve Kieni west and East Sub Counties but was scaled to one each due to financial constraints. However, Kega lamented that two years after the contract signed the contractual agreement; nothing had been done on the ground. “I am ashamed of queuing to beg for relief food when this area has fertile soils and hardworking people who can produce enough to feed and surplus for export if water is available,” Kega said. He disclosed that every time they follow on the dams projects, the excuse is that there are no funds. The dams the government promised to us, we did visibility studies and we agreed on two, Karimithu and Narumoro which are yet to commence. He called on the government to construct water pans and drill bore holes as a shot-time measure adding that construction of mega dams was the only permanent solution to food scarcity in the area. The law maker at the same time petitioned the government to consider sharing of the Equalization Fund pegged constituencies and not counties as the situation is currently. The politician noted that though Nyeri County is not classified as an Asal region, Kieni constituency which comprises of 52 per cent of Nyeri is semi-arid. “In the Equalization Fund, Sh 12 billion was budgeted for water and roads but Nyeri did not qualify because it is not categorized as marginalized though Kieni constituency is 52 per cent of Nyeri County,” he said. The MP took the opportunity to register with NIIMS at Lamura Chiefs office grounds and urged the residents to ensure they and their families are captured in the exercise to access government services. He rubbished rumours being peddled that the Huduma Number has anything to do with devil adding that it was aimed at enabling the government plan properly for its people and help to make the country more secure. Kieni west Sub County Deputy County Commissioner Ms Mercy Gatobu accompanied him among other local leaders.